This article is about the eating utensil. For the lip balm, see ChapStick. For other uses, see Chopsticks (disambiguation). The original Chinese character for "chopsticks"
Chopsticks are kitchen/eating utensils that are shaped pairs of equal-length sticks that have been used in virtually all of East Asia for over two millennia. First invented and used by the Chinese during the Zhou Dynasty, chopsticks later spread to other countries across East, South, and Southeast Asia including Japan, Korea, Vietnam, Cambodia, Laos, Nepal, Malaysia, Myanmar, Singapore, and Thailand[A] and to a much lesser extent Philippines. Chopsticks are smoothed and frequently tapered and are commonly made of bamboo, plastic, wood, or stainless steel. They are less commonly made from titanium, gold, silver, porcelain, jade, or ivory. Chopsticks are held in the dominant hand, between the thumb and fingers, and used to pick up pieces of food. The English word "chopstick" may have derived from Chinese Pidgin English, in which "chop chop" meant "quickly". According to the Oxford English Dictionary, the earliest published use of the word is in the 1699 book Voyages and Descriptions by William Dampier: "they are called by the English seamen Chopsticks". Another possibility, is that the term is derived from chow (chow chow) which is also a pidgin word stemming from Southeast Asia meaning food, thus chopsticks would simply mean 'food sticks'. The Standard Chinese term for chopsticks is kuàizi (Chinese: 筷子). The first character (筷) is a semantic-phonetic compound with a phonetic part meaning "quick" (快), and a semantic part meaning "bamboo" (竹). In ancient written Chinese, the character for chopsticks was zhu (箸; Middle Chinese reconstruction: d̪jwo-). Although it may have been widely used in ancient spoken Chinese, its use was eventually replaced by the pronunciation for the character kuài (快), meaning "quick". The original character, though still used in writing, is rarely used in modern spoken Chinese. It, however, is preserved in Chinese dialects such as Hokkien and Teochew as the Min Chinese languages are directly descended from Old Chinese rather than Middle Chinese. For written semantic differentiation between the "fast" (快) versus "chopsticks", a new character was created for "chopsticks" (筷) by adding the "bamboo" (竹) radical (⺮) to it. In Japanese, chopsticks are called hashi (箸). They are also known as otemoto (おてもと), a phrase commonly printed on the wrappers of disposable chopsticks. Te means hand and moto means the area under or around something. The preceding o is used for politeness. In Korean, 저 (箸, jeo) is used in the compound jeotgarak (Hangul: 젓가락), which is composed of jeo "chopsticks" and garak "stick". Jeo cannot be used alone, but can be found in other compounds such as sujeo (Hangul: 수저), meaning "spoon and chopsticks". In Vietnamese, chopsticks are called "đũa", which is written as 𥮊 with 竹 trúc (bamboo) as the semantic, and 杜 đỗ as the phonetic part. It is an archaic borrowing of the older Chinese term for chopsticks, 箸.
Chopsticks were invented in neolithic China before the Shang dynasty (1766–1122 BCE) and most likely much earlier prior to establishment of the Xia dynasty sometime around 9000 years ago. The earliest evidence were six chopsticks, made of bronze, 26 cm (10 inches) long and 1.1 to 1.3 cm (0.43 to 0.51 inches) wide, excavated from the Ruins of Yin near Anyang (Henan) and dated roughly to 1200 BCE; those were supposed to be used for cooking. The earliest known extant textual reference to the use of chopsticks comes from the Han Feizi, a philosophical text written by Han Fei (c. 280–233 BCE) in the 3rd century BCE. The first chopsticks were probably used for cooking, stirring the fire, serving or seizing bits of food, and not as eating utensils. Chopsticks began to be used as eating utensils during the Han dynasty. Chopsticks were considered more lacquerware-friendly than other sharp eating utensils. It was not until the Ming dynasty that chopsticks came into normal use for both serving and eating. They then acquired the name kuaizi and the present shape. To use chopsticks, the lower chopstick is stationary, and rests at the base of the thumb, and between the ring finger and middle finger. The second chopstick is held like a pencil, using the tips of the thumb, index finger, and middle finger, and it is moved while eating, to pull food into the grasp of the chopsticks. Chopsticks, when not in use, are placed either to the right or below one's plate in a Chinese table setting. Saibashi (菜箸; さいばし) are Japanese kitchen chopsticks used in Japanese cuisine. They are used in the preparation of Japanese food, and are not designed for eating. These chopsticks allow handling of hot food with one hand, and are used like regular chopsticks. These chopsticks have a length of 30 cm (12 in) or more, and may be looped together with a string at the top. They are made from bamboo, but for deep frying, metal chopsticks with bamboo handles are preferred, as the tips of regular bamboo chopsticks discolor and get greasy after repeated use in hot oil. The bamboo handles protect against heat. Similarly, Vietnamese cooks use the oversized đũa cả or "grand chopsticks" in cooking, serving rice from the pot. Chopsticks come in a wide variety of styles, with differences in geometry and material. Depending on the country and the region some chopstick styles are more common than others. Length: Chopsticks are typically about 23 centimetres (9.1 in) tapering to one end. Very long, large chopsticks, usually about 30 or 40 centimetres (12 or 16 inches), are used for cooking, especially for deep frying foods. Taper: Chopsticks are usually tapered in the end used for picking up food. Chinese chopsticks are more commonly blunt, while Japanese ones tend to be sharp and pointed in style. Korean chopsticks typically have sharp tapers, but with flatted grip. Material: A large variety of materials is available, including bamboo, wood, plastic, metal, bone, jade, porcelain, and ivory. Plastic chopsticks are relatively inexpensive, low in temperature conduction, and resistant to wear. Melamine is one of the more commonly used plastics for chopsticks. Plastic chopsticks are not as effective as wood and bamboo for picking up food, because they tend to be slippery. Also, plastic chopsticks cannot be used for cooking, since high temperatures may damage the chopsticks and produce toxic compounds. Metal (commonly stainless steel) chopsticks are durable and easy to clean, but metal is slippery. Silver is still common among wealthy families, as are silver-tipped wooden or bone chopsticks. A common material for Korean chopsticks. Other materials such as ivory, jade, gold, and silver are typically chosen for luxury. Silver-tipped chopsticks were often used as a precaution by wealthy people, as it was believed that the silver would turn black upon contact with poison. Embellishments: Wooden or bamboo chopsticks can be painted or lacquered for decoration and waterproofing. Metal chopsticks are sometimes roughened or scribed to make them less slippery. Higher-priced metal chopstick pairs are sometimes connected by a short chain at the untapered end to prevent their separation. Longer than most other styles at about 27 centimetres (11 in), thicker, with squared or rounded sides and ending in either wide, blunt, flat tips or tapered pointed tips. Blunt tips are more common with plastic or melamine varieties whereas pointed tips are more common in wood and bamboo varieties. Chinese sticks may be composed of almost any material but the most common in modern-day restaurants is melamine plastic for its durability and ease of sanitation. The most common type of material in regular households is bamboo. It is common for Japanese sticks to be of shorter length for women, and children's chopsticks in smaller sizes are common. Many Japanese chopsticks have circumferential grooves at the eating end, which helps prevent food from slipping. Japanese chopsticks are typically sharp and pointed. They are traditionally made of wood or bamboo, and are lacquered. Lacquered chopsticks were first used in the Yayoi Era, around 2000 years ago. Lacquered chopsticks are known in Japanese as muribashi, which has numbers of varieties, depending on where they are made and what types of lacquers are used in glossing them. Japan is the only place where they are decorated with natural lacquer making them not just functional but highly attractive. The Japanese traditional lacquered chopsticks are produced from the city of Obama in Fukui Prefecture, and come in many colors coated in natural lacquer and decorated with mother-of-pearl from abalone and with eggshell to impart a waterproof shield to the chopsticks extending their life. Edo Kibashi chopsticks have been created by the hands of Tokyo craftspeople since the beginning of the Taisho Period (1912-1926) roughly 100 years ago. These chopsticks are combined by high-grade wood (ebony, red sandalwood, ironwood, Japanese box-trees, maple), which craftspeople plane by hand. Edo Kibashi chopsticks, which are pentagonal hexagonal or octagonal, make them easy to hold. The tips of them are rounded to prevent to damage the dish or the bowl. In Japan, chopsticks for cooking are known as ryoribashi, and saibashi when used to transfer cooked food to the dishes it will be served in. In North and South Korea, chopsticks of medium-length with a small, flat rectangular shape are paired with a spoon made of the same, usually metal, material. The set is called sujeo. A spoon and chopstick rest, which is the piece to rest sujeo without touching the table, is used in traditional eating. Many Korean metal chopsticks are ornately decorated at the grip. In the past, materials for sujeo varied with social class: Sujeo used in the court were made with gold, silver, cloisonné and so on, while commoners usually used brass or wooden sujeo. Nowadays, sujeo is usually made with stainless steel, although bangjja is also popular in more traditional setting. Native cuisine uses a fork and spoon, adopted from the West. Ethnic Chinese immigrants introduced the use of chopsticks for foods that require them. Restaurants serving other Asian cuisines that utilize chopsticks use the style of chopstick, if any, appropriate for that cuisine. Long sticks that taper to a blunt point; traditionally lacquered wood or bamboo. A đũa cả (𥮊奇) is a large pair of flat chopsticks that is used to serve rice from a pot. Chopsticks are used in many parts of the world. While principles of etiquette are similar, finer points can differ from region to region. In Cambodia, a fork and spoon are the typical utensils used in Cambodian dining and etiquette. Spoons are used to scoop up food or water and the fork is there to help guide the food onto the spoon. Chopsticks are normally used in noodle dishes such as the Kuy Tiev and soup dishes. When eating soup the chopsticks will typically be paired with the spoon, where the chopsticks will pick up the food and the spoon will be used to drink the broth. Forks are never to touch the mouth, as it is thought as rude, thus they are not used to eat such dishes. When eating rice from a bowl, it is normal to hold the rice bowl up to one's mouth and use chopsticks to push or shovel the rice directly into the mouth. It is acceptable to transfer food to closely related people (e.g. grandparents, parents, spouse, children, or significant others) if they are having difficulty picking up the food. Also, it is a sign of respect to pass food to the elderly first before the dinner starts. Often, family members will transfer a choice piece of food from a dish to a relative's bowl as a sign of caring. A variation of this is to transfer the food whilst using one's own bowl as a support, underneath the food and chopsticks to keep food from falling or dripping, then transferring from there to a relative's bowl. It is poor etiquette to tap chopsticks on the edge of one's bowl; beggars make this sort of noise to attract attention. Holding chopsticks incorrectly will reflect badly on a child's parents, who have the responsibility of teaching their children. It is impolite to spear food with a chopstick. Anything too difficult to be handled with chopsticks is traditionally eaten with a spoon. It is considered poor etiquette to point rested chopsticks towards others seated at the table. Chopsticks should not be left vertically stuck into a bowl of rice because it resembles the ritual of incense-burning that symbolizes "feeding" the dead and death in general. It is also in South Korea and Japan. Traditionally, everyone would use their own chopsticks to take food from the dishes to their own bowl, or to pass food from the dishes to the elders' or guests' bowls. Today usually only in restaurants or gatherings with non-family guests present, serving chopsticks (公筷, "community-use chopsticks") are used. These are used to take food directly from serving dishes; they are returned to the dishes after one has served oneself. Due to better education regarding sanitary eating practices, many families are adopting this practice at private meals as well. Alternately, they can be left stationary on the table, especially in front of the host at the head of the table, so that the host can politely serve his honored guests on his left and right (and so they can serve him in return) without using their eating chopsticks. Chopsticks should not be used upside-down; it is considered acceptable to use them inverted to stir or transfer the food from another plate (which the person does not intend to consume completely). This method is used only if there are no serving chopsticks. One should not "dig" or "search" through food for something in particular. This is sometimes known as "digging one's grave" or "grave-digging" and is extremely poor form. When taking food from a communal serving dish, one's chopsticks should not pass over someone else's chopsticks, hand, or arm; the diner should either take food to the side or wait. When taking food from a communal serving dish, it is done with the palm uppermost, as it is considered rude to show one's knuckles to dining companions. The pointed ends of the chopsticks should be placed on a chopstick rest when the chopsticks are not being used. However, when a chopstick rest is not available as is often the case in restaurants using waribashi (disposable chopsticks), a person may make a chopstick rest by folding the paper case that contained the chopsticks. Reversing chopsticks to use the opposite clean end is commonly used to move food from a communal plate, and is acceptable if there are no communal chopsticks (for example, if the meal is hosted at someone's home). Chopsticks should not be crossed on a table, as this symbolizes death, or vertically stuck in the rice, which is done during a funeral. Chopsticks should be placed right-left direction; the tips should be on the left. In formal use, disposable chopsticks (waribashi) should be replaced into the wrapper at the end of a meal. In Korea, chopsticks are paired with a spoon (the set is called sujeo). Sujeo are placed on the right side and parallel to bap (rice) and guk (soup). Chopsticks are laid on the right side of the paired spoon. One must never put the chopsticks to the left of the spoon. Chopsticks are only laid to the left during the food preparation for the funeral or the memorial service for the deceased family members, known as jesa. Spoon is used for bap (rice) and soupy dishes, while most other banchan (side dishes) are eaten with chopsticks. It is considered uncultured and rude to pick up a plate or a bowl to bring it closer to one's mouth, and eat its content with chopsticks. If the food lifted "drips", a spoon is used under the lifted food to catch the dripping juices. Otherwise however, holding both a spoon and chopsticks in one hand simultaneously or in both hands is usually frowned upon. Historically, Thai people used bare hands to eat and occasionally used a spoon and fork for curries or soup, an impact from the west. Many Thai noodle dishes, such as pad thai, are eaten with chopsticks. Using chopsticks and spoon only for specific dishes, such as noodles. Chopsticks should not be left stuck into a bowl with food, as this symbolises "feeding for dead people". It is considered impolite to make a sound with chopsticks. It is poor etiquette to rest or hold chopsticks pointing towards others, as pointing is considered disrespectful. Chopsticks should not be used with a bowl of rice. Unlike with Chinese dishes, it is also permitted to use chopsticks to pick up rice from plates, such as fried rice. One should not pick up food from the table and place it directly in the mouth; food must be placed into one's own bowl first. Chopsticks should not be placed in the mouth while choosing food. Chopsticks should never be placed in a "V" shape when done eating; this is interpreted as a bad omen. The individual's chopsticks should not be dipped into a communal soup bowl (for example, when eating canh chua). Reversing the ends of the individual's chopsticks to the "clean ends" is preferred if communal serving utensils are not provided. Disposable chopsticks in a university cafeteria recycle bin in Japan. The most widespread use of disposable chopsticks is in Japan, where around a total of 24 billion pairs are used each year, which is equivalent to almost 200 pairs per person yearly. In China, an estimated 45 billion pairs of disposable chopsticks are produced yearly. This adds up to 1.66 million cubic metres (59×10^6 cu ft) of timber or 25 million fully grown trees every year. In April 2006, China imposed a 5% tax on disposable chopsticks to reduce waste of natural resources by overconsumption. This measure had the most effect in Japan as many of its disposable chopsticks are imported from China, which account for over 90% of the Japanese market. American manufacturers have begun exporting American-made chopsticks to China, using sweet gum and poplar wood as these materials do not need to be artificially lightened with chemicals or bleach, and have been seen as appealing to Chinese and other East Asian consumers. The American-born Taiwanese singer Wang Leehom has publicly advocated the use of reusable chopsticks made from sustainable materials. In Japan, reusable chopsticks are known as maihashi or maibashi (マイ箸, meaning "my chopsticks"). A 2003 study found that regular use of chopsticks by the elderly may slightly increase the risk of osteoarthritis in the hand, a condition in which cartilage is worn out, leading to pain and swelling in the hand joints. There have also been concerns regarding the use of certain disposable chopsticks made from dark wood bleached white that may pose a health risk, causing coughing or leading to asthma. A 2006 Hong Kong Department of Health survey found that the proportion of people using distinctly separate serving chopsticks, spoons, or other utensils for serving food from a common dish has increased from 46% to 65% since the SARS outbreak in 2003. ^ In Singapore and Malaysia, the ethnic Chinese community traditionally consume all food with chopsticks while the ethnic Indians and Malays (especially in Singapore) use chopsticks only to consume noodle dishes – the use of a spoon or fork however is more common. In Laos, Myanmar, Thailand, and Nepal chopsticks are generally used only to consume noodles. ^ Still widely used across East Asia, but in China has become archaic in most Chinese dialects except Min Chinese. ^ "Etiquette in Singapore - Frommer's". ^ Suryadinata, Leo (1 January 1997). "Ethnic Chinese as Southeast Asians". Institute of Southeast Asian Studies – via Google Books. ^ Lininger, Mike. "Philippine Etiquette | International Dining Etiquette". Etiquette Scholar. Retrieved 2019-01-13. ^ Merriam-Webster Online. "Definition of chopstick". ^ Norman, Jerry (1988) Chinese, Cambridge University Press, p267. ^ Chisholm, Hugh, ed. (1911). "Chopsticks" . Encyclopædia Britannica. 6 (11th ed.). Cambridge University Press. p. 269. ^ Wilkinson, Endymion (2000). Chinese history: A manual. Cambridge: Harvard University. p. 647. ISBN 978-0-674-00249-4. ^ Norman, Jerry (1988) Chinese, Cambridge University Press, p76. ^ "Sipit Meaning | Tagalog Dictionary". Tagalog English Dictionary. Retrieved 2019-01-13. ^ 卢茂村 (Lu, Maocun). "筷子古今谈 (An Introduction to Chopsticks)", 农业考古 (Agricultural Archaeology), 2004, No. 1:209–216. ISSN 1006-2335. ^ "Le due leggende sulle bacchette cinesi". Italian.cri.cn. 2008-06-19. Retrieved 2009-07-14. ^ (in Chinese) 嚴志斌 洪梅编著 『殷墟青銅器︰青銅時代的中國文明』 上海大学出版社, 2008-08, p. 48 "第二章 殷墟青銅器的類別與器型 殷墟青銅食器 十、銅箸 这三双箸长26、粗细在1.1-1.3厘米之间，出土于西北岗1005号大墓。陈梦家认为这种箸原案有长形木柄，应该是烹调用具。" ISBN 7811180979 OCLC 309392963. ^ Needham, Joseph. (2000). Science and Civilization in China: Volume 6, Biology and Biological Technology, Part 5, Fermentations and Food Science. Cambridge University Press. p. 104. footnote 161. ^ Endymion Wilkinson, Chinese History: A Manual (Cambridge, MA: Harvard University Press, Rev. and enl., 2000), 647 citing Yun Liu, Renxiang Wang, Qin Mu, 木芹. 刘云. 王仁湘 刘云 Zhongguo Zhu Wen Hua Da Guan 中国箸文化大观 (Beijing: Kexue chubanshe, 1996). ^ Reiber, Beth; Spencer, , Janie (2010). Frommer's Japan. John Wiley & Sons. p. 37. ISBN 0-470-54129-6. The proper way to use a pair is to place the first chopstick between the base of the thumb and the top of the ring finger (this chopstick remains stationary) and the second one between the top of the thumb and the middle and index fingers. ^ Giblin, James Cross (1987). From hand to mouth: How we invented knives, forks, spoons, and chopsticks, & the manners to go with them. New York: Crowell. p. 35. ISBN 978-0-690-04660-1. ^ 蓝翔. (2011). 筷子, 不只是筷子 = Chopsticks. Mai tian chu ban. ISBN 9789861207179. OCLC 742379175. ^ "さいばし". Shogakukan and NTT Resonant Inc. Retrieved 2014-02-23. ^ ""Đôi đũa"". Batkhuat.net. 2011-06-19. Retrieved 2019-02-06. ^ Access Asia: Primary Speaking and Learning Units. Carlton, Vic. : Curriculum Corporation. 1996. p. 80. ISBN 978-1-86366-345-8. ^ Wang, Q. (2015). Chopsticks: A cultural and culinary history. England: Cambridge University Press. pp. 80–87. ISBN 9781107023963. ^ Shimbo, Hiroko (2000). The Japanese Kitchen. Boston, MA: Harvard Common Press. p. 15. ISBN 1-55832-177-2. ^ Gilbert, Abigail. "Cambodian Table Manners". travelfish.org. ^ "Food, Dining, & Drinks in Cambodia". safaritheglobe.com. ^ "Difference". Chinatoday.com.cn. Archived from the original on 2012-07-21. Retrieved 2009-07-14. ^ "Pandaphone". Pandaphone. Retrieved 2009-07-14. ^ "Chinese Chopsticks". chinaculture.org. p. 4. Archived from the original on 2012-04-28. Retrieved 2012-02-05. ^ "Manners in the world". 오마이뉴스. 2017-09-05. Retrieved 2018-04-13. ^ a b c d Vardaman, James; Sasaki Vardaman, Michiko (2011). Japanese Etiquette Today: A Guide to Business & Social Customs. Tuttle Publishing. pp. 68–69. ISBN 9781462902392. ^ a b De Mente, Boye Lafayette (2011). Etiquette Guide to Japan: Know the rules that make the difference!. Tuttle Publishing. pp. 43–44. ISBN 9781462902460. ^ Tokyo YWCA World Fellowship Committee (1955). Japanese Etiquette: An Introduction. Tuttle Publishing. p. 154. ISBN 9780804802901. ^ Tokyo YWCA World Fellowship Committee (1955). Japanese Etiquette: An Introduction. Tuttle Publishing. p. 61. ISBN 9780804802901. ^ a b c "Where should I put the spoon on the table? Correct spot location" (in Korean). Retrieved 2018-04-13. ^ Lee, MinJung (2009). Step by Step Cooking Korean: Delightful Ideas for Everyday Meals (New ed.). Singapore: Marshall Cavendish. p. 9. ISBN 981-261-799-X. ^ Park, Hannah (2014). Korean Culture for Curious New Comers. Translated by Chun, Chong-Hoon. Pagijong Press. p. 117. ISBN 9788962927252. ^ a b c "The Scoop on Chopsticks in Thai Food". ^ "The Scoop on Chopsticks in Thai Food". Brooklynbrainery.com. 2012-01-30. Retrieved 2019-02-06. ^ "7 biggest misconceptions about Thai food - CNN Travel". ^ "Do Thai people actually use chopsticks or is it to accommodate the Chinese? - Quora". ^ Hayes, Dayle; Laudan, Rachel (2009). Food and Nutrition. New York: Marshall Cavendish Reference. p. 1043. ISBN 978-0-7614-7827-0. ^ Rowthorn, Chris (2007). Japan (10th ed.). Lonely Planet. p. 73. ISBN 978-1-74104-667-0. ^ a b "Rising Chinese chopstick prices help Japan firm". Asia Times Online. Asia Times. Retrieved 28 September 2011. ^ a b c d "Japan fears shortage of disposable chopsticks: China slaps 5 percent tax on wooden utensils over deforestation concerns". msnbc.com. Retrieved 19 September 2011. ^ "Annual output of 4 billion pairs of biodegradable plant fiber chopsticks project of Jilin Agricultural Science Hi-tech Industry Co., Ltd". People's Government of Jilin Province. Retrieved 28 September 2011. ^ "China imposes chopsticks tax". ABC News. Retrieved 28 September 2011. ^ "As China goes ecological, Japan fears shortage of disposable chopsticks". USA TODAY. 2006-05-12. Retrieved 28 September 2011. ^ McCurry, Justin (2006-05-14). "Japan faces chopsticks crisis". The Guardian. London. Retrieved 28 September 2011. ^ Philip Graitcer (2011-07-17). "Chopsticks Carry 'Made in America' Label". Voanews.com. Retrieved 2012-12-21. ^ "Wang Leehom, "Change My Ways"". english.cri.cn. 2007-08-22. Retrieved 2008-09-07. ^ "Career". Archived from the original on 29 March 2012. Retrieved 19 September 2011. ^ "Chopstick Economics and the "My Hashi" Boom | Japan". Stippy. Retrieved 2010-08-16. ^ "Xinhuanet News Article". News.xinhuanet.com. 2005-06-02. Archived from the original on 2009-08-05. Retrieved 2009-07-14. ^ "Hong Kong Department of Health survey". .news.gov.hk. 2006-12-26. Archived from the original on 2009-05-05. Retrieved 2009-07-14. Wikimedia Commons has media related to Chopsticks. 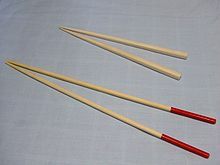 Look up chopsticks in Wiktionary, the free dictionary. This page was last edited on 25 April 2019, at 05:21 (UTC).